Postnatal depression is very common, affecting at least one in ten new mothers and one in 14 fathers, but many can suffer in silence because their condition is not recognised or dismissed as simply the 'baby blues'. Post natal depression is an illness, and although it is not known for certain what causes it, some experts believe that the sudden change in hormones after the birth may trigger the condition. Getting post natal depression is not failing and nor is it related to how capable a person is, it is an illness. When does postnatal depression develop? It usually develops within the first 4-6 weeks, but can start even several months following childbirth and can emerge at any time during the first year. It comes on either gradually or all of a sudden, and can range from being relatively mild to hard-hitting. Post natal depression is still an illness that is not widely understood by mums who experience it or by their family and friends. In fact, it is often viewed with shame by sufferers who may feel a 'failure' or a 'bad mother' because they feel unable to cope. In fact, the opposite is true, with all the evidence showing that mothers with post natal illness are at least as good at mothering as those without. 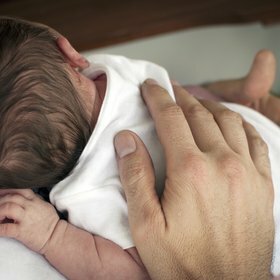 How is postnatal depression diagnosed? Postnatal depression is usually diagnosed by a doctor based on what those who know you, tell him or her. Sometimes the doctor may do a blood test to rule out physical reasons for the symptoms, such as anaemia. A short questionnaire has been developed called the Edinburgh Post Natal Depression Scale and has 10 simple questions. Doctors and health visitors may ask a patient to fill it in if they suspect post natal depression. The most important thing you can do for yourself is believe that you will get better. Try to get as much rest as you can although this can be difficult with a small baby. Try to recruit the help of friends or family and readily accept any offers of help that come along. This is very important, as tiredness seems to make depression worse. Don't try to force yourself back to normal too quickly. Many mothers feel that by keeping busy such as going back to work, things will right themselves, but this can actually prolong the illness. Be kind to yourself. Don't force yourself to do things you don't really want to do or that upset you. Exercise. It can be difficult to be active when all you want to do is curl up and go to sleep but exercise releases endorphins. Possible sources of help include the GP, midwife, health visitor, community psychiatric nurse, psychotherapist, counsellor or psychiatrist. Experts suggest that the best treatment for post natal depression may be a combination of practical support and advice, psychotherapy, counselling and, if necessary, antidepressants. Support and understanding from friends and relatives can help recovery and it is far better to talk about your feelings rather than bottling them up. Ask your health visitor about what is available in the area, such as self help or support groups which can provide lots of encouragement and advice. These treatments can be very effective and offer you the opportunity to explore any underlying factors that could have contributed to the post natal depression. Although the availability of counselling can depend on where you live, many GPs now have a counsellor or psychotherapist attached to their surgery. They can also refer to a psychologist or psychiatrist on the NHS. Many mothers, particularly those with milder symptoms, recover without antidepressants, but they can be very effective for post natal depression. A GP can prescribe different kinds of medication to help and it is important to discuss all the options fully beforehand. They can take a month or two to start working effectively, although if you don't feel any benefits during that time, see your doctor again and he or she may need to try a different drug or adjust the medication. It's also important to remember that any medication can enter the breast milk and this will be a major consideration.